Okay WWE SummerSlam 2016, Excite Me! I’m not the kind of likes to make predictions about upcoming pay-per-views like SummerSlam because more than likely, I am way off base and in many cases, I am sadly disappointed. This Sunday at the second biggest pay-per-view of the year, WWE has a chance to make a statement that it not only listens to what the fans want, but it also sees the future and it is as bright as it has been in about a decade. After watching both Raw and Smackdown Live trade blows back and forth for the past month, it is clear there is a new era we all have embarked on. As a fan, I love the idea of the “separate but equal” concept of two brands trying to compete with each other yet have its own place in Vince McMahon’s wild kingdom. As a writer and blogger, this might be the most exciting time to watch something old become something new. For years WWE has crawled its way toward big events, only to stop in the middle of the trek because of a cramp or two in booking and promotion. This time, they get it loud and clear. Like many who I have spoken to, SummerSlam this year could be huge – the biggest event of 2016. Honestly, it should be. Like everything else in this business, I question what happens next. Will Finn Balor beat Seth Rollins on Sunday? Does the company have enough trust in Dolph Ziggler to carry the WWE World Title when it was reluctant to let him fly as champion before? Can John Cena find life after AJ Styles and is The New Day about to become an afterthought? See what happens at 3 am and there is nothing to do but think? Yes, these are the kinds of things that keep me awake at night. Yes, I also know I need another hobby. This kind of wrestling era works because for once, the McMahons are not overthinking it. They are working to promote the future. John Cena is no longer the focal point. 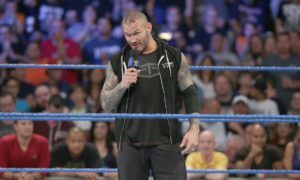 Randy Orton is not the go-to player on the bench and Roman Reigns is finally looking like a “hero” who will defend Old Glory. There are a few parts of the puzzle that need to fit a bit better – like Sheamus, Cesaro and possibly Chris Jericho and Kevin Owens – but there is a start to something big. The infant cannot learn to run unless he learns to walk first. WWE is learning to walk all over again in this new phase of the business. When I started this blog, I thought I should hit on matches and predictions and how things should go. I cannot do that if there is too much to be written on Sunday. But I will say this – if the company is working hard enough to make the preshow two hours of commentary and build, the live show had better be damn good! This has to be the event, like Battleground, we all talk about. But has to be even stronger. Wrestling matches are supposed to tell a story. That is the basis for WWE’s three-match feud. Styles-Cena has a chance to write a solid ending. Seth Rollins and Balor have a chance to write an exciting first chapter. The New Day has a chance to write an exciting exit when Karl Anderson and Luke Gallows take the World Tag Team Titles. Charlotte and Sasha Banks are rewriting history in the Women’s Division. If the notion of lesser feuds and better storylines was supposed to happen once the brands split, it did not happen. Storylines are better, interest is higher and we are the benefit of the foresight. To steal a line from Daniel Bryan, for all of this we should be grateful. Like everyone else on Sunday, I am going to watch and wait. I am going to write a column or two or three. More importantly, I am going to see if this new concept works. If it does, then the next three months of wrestling will be as exciting as it ever was. If it doesn’t, then like everyone else, I am going to be disappointed. I am hoping to be dazzled. I am hoping I won’t be let down. Honestly, I think I feel both emotions. This has to be great, but I know like everyone else, this isn’t going to be perfect. But I can hope for that, because for too long the product has left me and others empty and wanting more.